Register for Camp Able today! 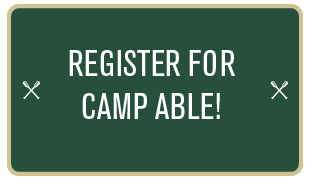 Camp Able registration is now open! That so many folks have called to ask about when it would open is a testament to Camp Able being a much-beloved session. The wait is over and our team is looking forward to another great year. The Camp Able Committee has been hard at work behind-the-scenes to ensure that we are constantly improving our program. This year included reaching out to, connecting with, and sharing ideas with other camps across the country offering special needs sessions. This reinforced our confidence that we are running our program in line with industry standards AND pointed us to new outside resources for enhancing the Camp Able training and program. Camp Able is limited to only 40 campers and is going to fill up very quickly, so don’t delay. Learn more about Camp Able and get signed up today! If you have any questions, please call Daniel in the camp office at 318.765.3794. The 2019 Summer Camp Schedule Is Now Available!